Second pregnancy : My labor story part II | escaped. So the nurse, after telling me to settle down (because I was "only 3 cm dilated" T.T) went out of the labor room. Husband was at the reception to submit my admission form. Suddenly I felt completely alone, dealing with the mega contraction somewhere below my belly. Took a look around - and realized that it was the same labor room I had delivering Rayyan! Haha. 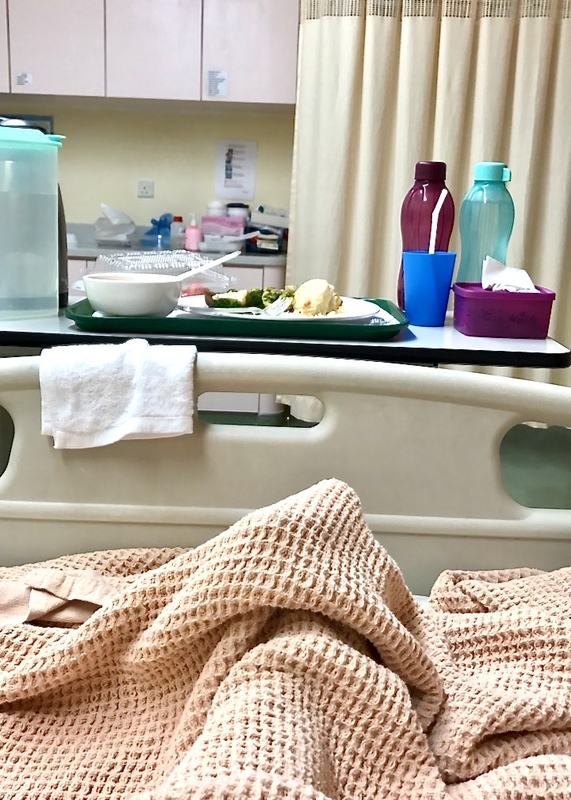 Contraction was undeniably more painful than before - thought I'd have the strength to tahan this time around after experiencing it firsthand the last time, but this time, I really felt as if I was going to die. There's no way I could endure this, I thought. "Saya nak epidural, boleh ke?" And she gave me a face. "Eh tak payahlah, ni anak nombor dua kan? Boleh tahan lah tu..sabar ye"
T.T Seriously what is this kakak's problem with epidural?! Though the painful contraction caused me to almost pass out, I managed to take a good look at her face. Like, what are the odds. But this time, I wasn't going to give in. Each time a different nurse came in, I'd ask for epidural - until they got sick of it haha. "OK we'll prepare the epidural for you"
They monitored the scan machine right beside me and the anesthetist came (after longgg hours of waiting). By this time, husband kept giving me gas until at some point, I passed out whenever the contractions were low and jerked up again when they peaked. The nurses kept coming to check my dilation. 8 cm! By then, I felt a hugee gush of water coming outside of down there - more water broke. Felt cool that I experienced it without the doctor's intervention (like the last time). After the epidural, I could feel the contractions slowly subsided. Instead of panting and grabbing husband's shoulder whenever they peak, now I could finally lay still and layan the less painful contraction. The gas' effect was going away, too. For the first time, I could breathe and just soak in the experience. The nurses began asking me to push, because the baby's head was apparently not inside the 'rim'. "Sikit lagi nak masuk dah kepala tu! Push!" "Saya tak nampak baby gerak pun! Push!" Was the longest time in my life. Apparently, since I took the epidural, pushing gets trickier because I can no longer feel the contractions - hence I've lost the sense down there to push the baby out. Literally, I couldn't feel anything - tried to push as I remember it, but nothing was happening. After some time, the nurses gave in and called the doctor. She came and took a look at my south - with a look of concern in her eyes. Asked the nurse to prepare the vacuum to assist the delivery process. "OK Zatil, we're going to vacuum the baby out. You don't have to push so hard, since the vacuum will do it for you. Don't worry"
Wouldn't have seen this coming in a million years, but at that moment I knew I had no other choice. So the doctor inserted the vacuum thingy inside (which I felt nothing) and asked me to push. The whole process took less than 10 minutes, which I'm still surprised about (after reading some horror stories on vacuum assisted delivery). And at 9.39 am, Ahmad Rafiy was born! "You're lucky. If the baby is any bigger, we'd have to do Caeserean instead because of his size compared to your size, which makes it hard for him to come out. Next time, don't eat so much during pregnancy"
I was drowsy, but I was offended lol. Ahmad Rayyan and Ahmad Rafiy, I hope you'd read this one day and learn that Mommy is always right, OK?